Last week I published a project management alphabet, and I admit it, I had a hard time coming up with terms for some of the less common letters. I ended up using Zombie Project Management for the letter Z. One of my favourite sayings is ‘no plan survives contact with the enemy.’ Zombie Project Managers follow the plan, regardless of the changing environment. Project management isn’t rocket science, and it shouldn’t be hard to get right. But you do need to apply an element of intelligence and critical thinking to what you do. Projects need to be shepherded along, sponsors don’t always know best, and sometimes you have to suggest that your project is stopped. Zombie Project Managers can’t do this. They operate in a completely text book fashion, without applying any logic, context or thought to how to do things in the most effective way. One of my favourite sayings that we overuse at my company is ‘no plan survives contact with the enemy.’ Zombie Project Managers follow the plan, regardless of the changing environment around them. Fortunately, most of the people I’ve worked with over the years have been switched on and very un-Zombie. I haven’t come across many Zombie Project Managers, but I know they are out there (cue spooky music). I hope you don’t have any in your organisation, either. 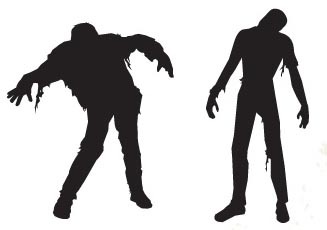 What are the other traits of Zombie Project Managers that you have come across? Like this image? It’s from BenBlogged.com. On the topic here is a link to Tom Demarco’s book Adrenalise Junkies and Template Zombies. I’ll have a look at that, thanks Craig. I have recomended that this term be added the the refresh of the APM Body of knowlege. http://www.apm5dimensions.com/blog/divided-common-language. I am sure Liz will strike out my membership of the APM. See you at the conference. Let’s see if we can get it in the dictionary! Marilyn, Krystal, thanks for your comments. I hope that you find ways to deal with your zombies! I totally love this post! As a matter of fact, we do have members who are just like zombies and it’s not helping at all! Elizabeth, this awesome blog post has inspired me! Yes, I see these PM zombies every day. These zombies contribute to what is defined as the Iron Law of Bureaucracy. It states, in any bureaucratic organization there will be two kinds of people: those who work to further the actual goals of the organization, and those who work for the organization itself. One example in project management, would be PMs who work hard and look for ways to deliver value to the customer, versus PMs who work to protect any defined process (including those with no value). The Iron Law states that in ALL cases, the second type of person will always gain control of the organization, and will always write the rules under which the organization functions. These zombies don’t eat brains, they eat time and resources in the name of project management! So, sooner or later, zombies will take over your project. Be afraid. Be very afraid! Per your inspiration, I’m writing a blog post for Zombie Management Strategy. Who knows, maybe I’ll write a whole series on the zombies. Excellent! Looking forward to reading about how to manage the zombies! I haven’t had Zombie PM contact (phew!) but I have had many PMs that didn’t being the team inboard with changes. We had the initial mpp and one or two from early in the project. PMs can zombie on specific duties only, to use your example. That’s a great point, Diwat, thanks. You don’t have to be a zombie across the board – there’s a risk that people are zombie-like on just one or two tasks or responsibilities. I hadn’t thought of that! Elizabeth, I really like your blog post and term zombie PM. I have run into many zombie PM’s especially in large very process oriented environments. Not that I oppose process but at times I have seen too much process remove the creativity and confidence that a PM needs to have. I also think lack of experience playing into this mind set as well. Monique, I agree. I think the zombie approach sets in when people are too hung up on doing things ‘by the book’. Rigid application of PRINCE2 for example. I imagine that some people try to compensate for lack of experience by relying heavily on process and forgetting that actually we’re paid to do a job, not follow a set of rules.